Multiple nematode larvae are seen in the cerebral parenchyma and the morphology of the parasite is consistent with Baylisascaris spp. 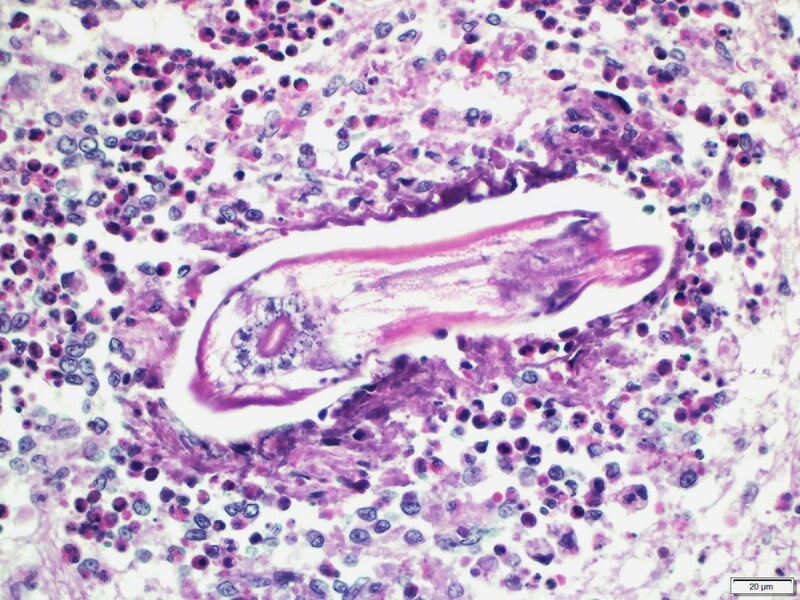 In the tissue sections, the parasites are 40-50 µm wide with variable lengths and are surrounded by eosinophilic and granulomatous inflammations. The parasites have several microscopic features that are characteristic for ascarids, including eosinophilic cuticle, thin hypodermis, polymyarian coelomyarian musculature, pseudocoelom, prominent lateral cords, and uni-cellular epithelium of the digestive tract. Multifocal randomly distributed foci of malacia are observed in the cerebrum, brainstem and cerebellum with gliosis and infiltrates of macrophages, eosinophils, and multinucleated giant cells. Multifocal and disseminated eosinophilic and granulomatous meningoencephalitis with intralesional nematode larvae is diagnosed. Baylisascaris sp. infection and associated encephalitis has been reported in woodchucks, many other mammals, birds, and human. Baylisascaris procyonis and Baylisascaris columnaris are two of the most commonly reported species that can cause diseases in woodchucks. The usual definitive host of B. procyonis is a raccoon and the definitive host of B. columnaris is a skunk. Infection of Baylisascaris spp. occurs most likely due to ingestion of materials contaminated by raccoon or skunk feces. Special thanks to Dr. Rory Chia-Ching Chien, DVM, MSc, Anatomic Pathology Resident at Oklahoma State University, Center for Veterinary Health Sciences! !